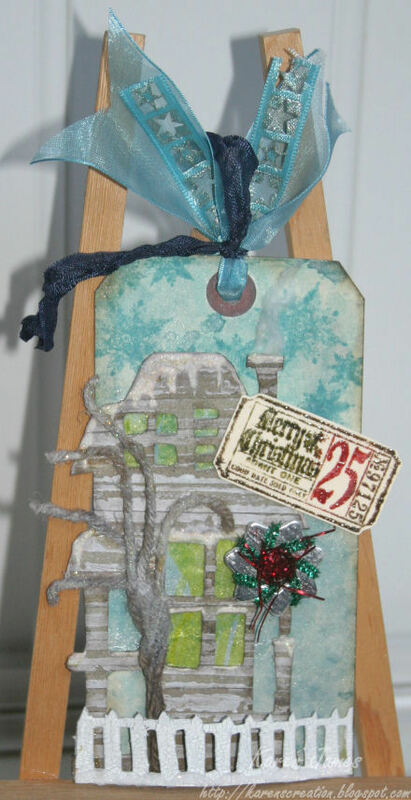 Tag # 7 - The tag was embossed with an inked folder (Cuttlebug 'Distressed Stripes') and then coloured more with Distress Inks and has a layer of Distress Rock Candy Stickles spread over it. The poinsettia is hand-cut pieces made with Sticky-back canvas on Grungepaper sprayed with Color Wash and a Pearly Pearls solution and then Stickles added with an 'accroutement' button in the centre. 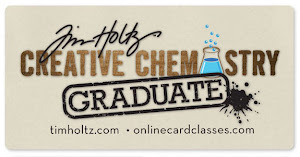 The letters are pre-cut Grungeboard coloured with Distress inks and stamped with black Archival ink. 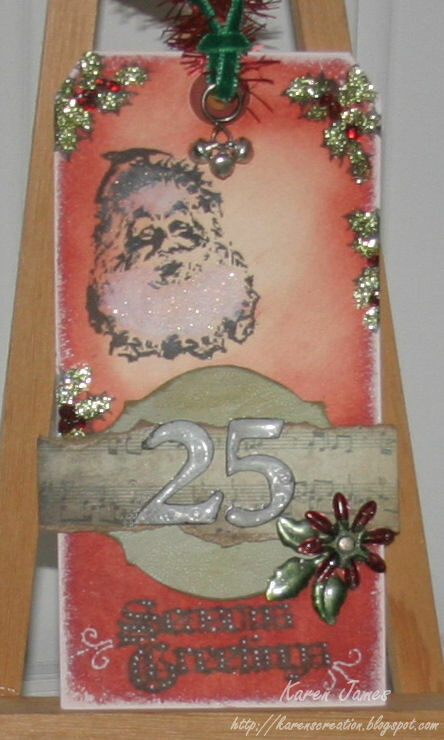 Tag # 8 - I used the 'extreme masking' technique to create the Santa and sleigh background with Distress and archival inks and Tim Holtz 'seasonal' masks. The houses are cut with his Townscape 'On the Edge' die and I finished the tag with various pieces of idea-ology metal work and a printed greeting coloured with Distress inks. Tag # 9 - The rich colours of this tag were created by spraying it with gold Cosmic Shimmer and Pearly Pearls solution after it was stamped with a Tim Holtz music stamp and sepia Archival ink. 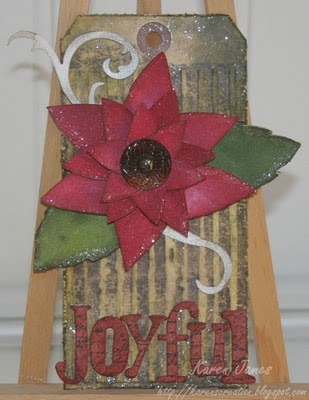 I created the rosette die with Tim Holtz paper, Walnut Stain Distress ink and more spray. 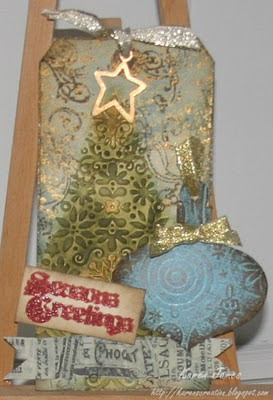 Finished with letters cut on the Cuttlebug from sanded ColorCore card, brads, and bits of decoration from my stash. Here's the second installment of my tags following Tim's inspirational examples. 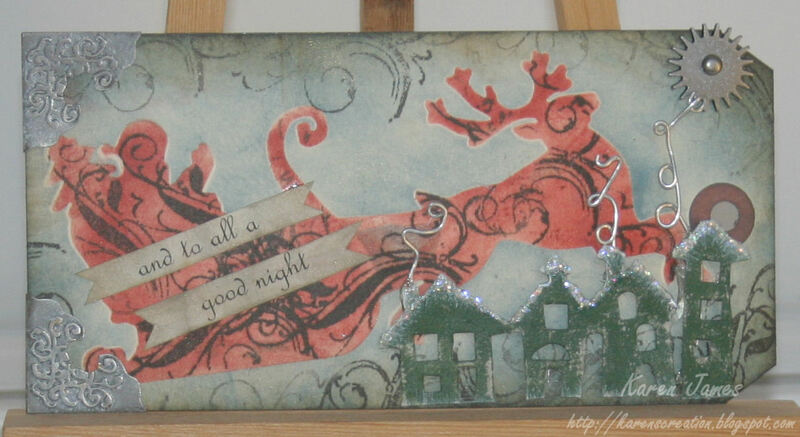 Tag # 4 - I don't have the same paper Tim used or the 'facets' but I used the paint resist technique with Distress inks to create the background and I loved the technique he describes with the alcohol inks and I used a fragment charm for this. Tag # 5 - The focus technique was enamelled metal but, as I didn't have the metal numerals, I painted and embossed grungeboard numbers instead. I hand-cut the plaque shape and used 'picket fence' crackle paint and coloured this with Distress inks. I used the paint resist technique with distress inks again on the tag and I used the mini set of Christmas stamps, alcohol inks on 'foliage' and lots of Stickles, white flock and glitter. Tag # 6 - As I didn't have the same embossing folder or die that were the focus of this tag, I substituted older Cuttlebug designs and used the same techniques. If you haven't seen Tim's tags yet (where have you been ??? ), then you should go see how generous he has been in sharing techniques and ideas, not just for tags but for lots of other things too. Voici les trois étiquettes #4 – 6 que j'ai créées avec les mêmes techniques chez Tim Holtz. Firstly, apologies for being such a bad blogger last month: Made lots of things, just didn't get time to blog them. I did however raise 60€ for the Téléthon charity by selling my cards last Saturday, despite the terrible weather! Also grateful to have received 2 stamps and some crinkled ribbon from Kristine: Her own creations! The ribbon could not have been better timed as you'll spot below! Tag #1 : I don't have the 'Rickety House' or the fence dies so I sketched these on to grungepaper and cut them out by hand. I have tried on all the tags to follow the techniques so used the Cuttlebug 'Distressed Stripes' folder to emboss a second layer of grungepaper and use as instructed on the house. I mixed white flock and glitter together to make the 'snow' and coloured plastic with a yellow permanent pen to line the windows. 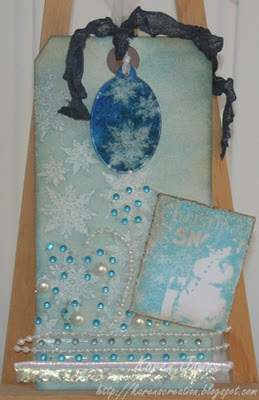 My 'tree' is made of wool hardened with glossy accents, white paint dabber and my 'snow' mixture. Tag #2 : Couldn't follow the technique as I don't have any felt but I went ahead and inked my stamp with different colors of distress (forest moss and walnut stain) and just stamped 3 times without re-inking the stamp to get the impression of lots of trees. 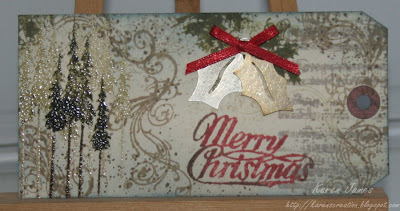 I embossed this and then inked and stamped the tag using Tim's Mini Holidays 2 stamps. 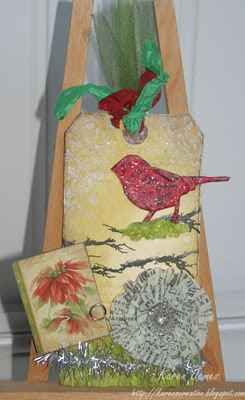 Tag #3 : I substituted in a grungeboard bird from the 'Nature' pack and covered this with tissue tape, alcohol inks and Rock Candy Stickles. Loved making the tissue tape flower and I added a fringe and 'nest' of silk paper with the branch from Tim's 'Urban Grunge' stamps and a PaperMania vintage die-cut mounted on grungepaper. With the Rock Candy Distress Stickles used on this tag, I'm also submitting it to Linda's great 'Compendium of Curiosities' challenge #24. 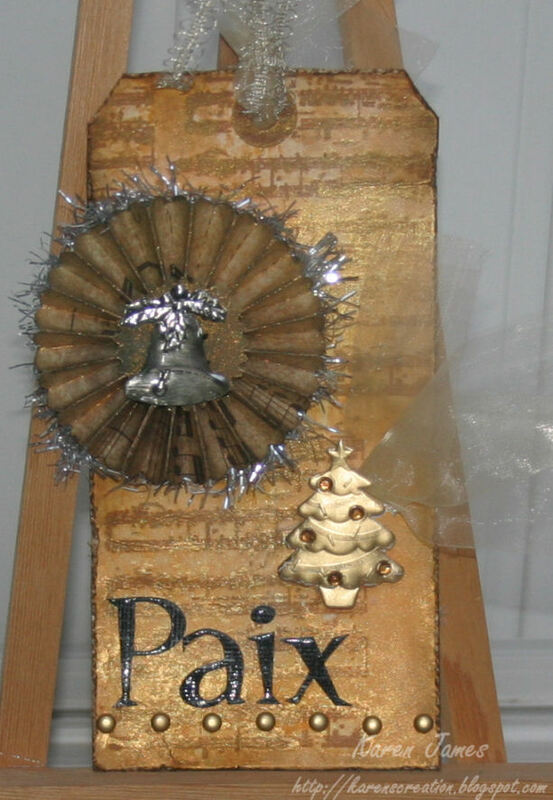 Mes premiers trois étiquettes des Noël chez Tim Holtz : Depuis le 1 décembre, toutes les instructions sont sur son blog avec une nouvelle étiquette chaque jour pour les 12 jours. Le but n'est pas à copier mais pour essayer les techniques et prendre l'inspiration de ses modèles.